Gas Welding Explanation and Tutorials! Gas welding is another broad term (like Arc welding) that describes a process or welding that uses gas to heat your metal for welding as well as your rod or filler metal. However, filler metal is not always needed or used. 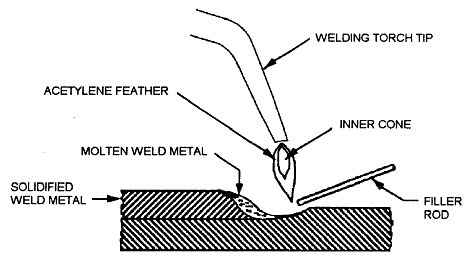 Another common term used for this process is oxy fuel welding. What's the most popular way to weld with gas? 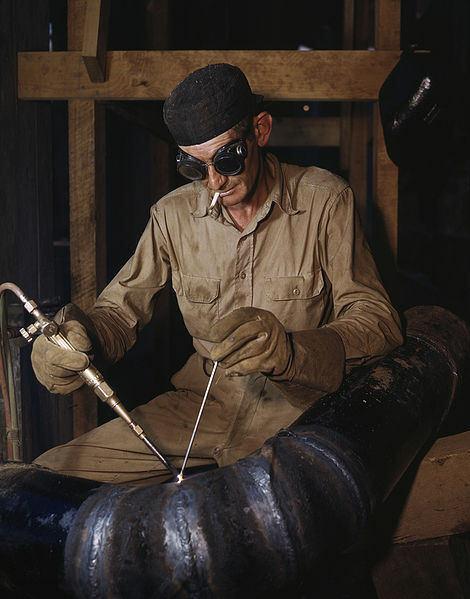 Answer: Oxy Acetylene welding. Gas welding basically is gas used as the fuel, and then it's mixed with oxygen, or sometimes it's mixed with air and you use this combination to create the flame which will be hot enough to melt your metal. As described in the cutting torch article, the mixture of oxygen and the gas are mixed in the welding torch or cutting torch tip, not the body of the torch assembly. The welding torch (which is usually detachable from the torch base assembly and can be replaced with the cutting torch attachment and vice-versa) gives you the ability to regulate the the flame and therefore the heat you apply to your metal and rod (filler metal). Get The Entire Aluminum Welding DVD Here. As I explained above, Oxy Acetylene was the common gas used for oxyfuel welding. However, another was introduced, and it's called MAPP (see below). The main purpose of the welding torch flame is to create a highly focused flame that has the required heat to melt metal and therefore create a pool of molten metal. The torch flame also protects the pool of molten metal from atmosphere contaminants as you weld. Gases which are not good for gas welding are natural gas, butane, and propane. Although many people do use propane for their cutting torch since it does not cost as much as acetylene. The reason that these gases are not good for gas welding are due to the fact that the heat from the flame is not high enough to for a highly focused welding procedure. It can also cause oxidation during welding, and oxidation is the enemy of welders. Get The Entire Oxy Acetylene Welding DVD Here (Highly Recommended). Pressure Gas Welding: This is a welding process that is not used very often because the heat is not as high as the other processes, but is commonly used for welding lead. It's a process where the a combination of pressure and flames are spread across the surfaces to be welded together all at the same time. So you use both pressure and heat to create the weld. The gas used is usually Acetylene, and filler metal is not used. Oxy Hydrogen Welding: When hydrogen and oxygen combusts heat is produced in this welding process. Much like other welding processes, you will not use any pressure and filler metal is used, if necessary. The reason this process is not as popular is because the flare has no color. And if you don't have color in your flame it's hard to regulate and adjust the hydrogen and oxygen. If you need to weld metal with that requires low temperature then this may be something to look into. Air Acetylene Welding: If you will be doing any soldering or brazing copper pipe this is may be a good choice. To create the weld, heat is created as a result of air and acetylene combustion. You will not use any pressure, and as usual, you will use filler metal as needed or not at all depending on the situation. Oxy Acetylene Welding: This is a very popular way to gas weld because it produces a lot of heat as a result of acetylene and oxygen combustion, and it's relatively easy to regulate. Pressure and rod (filler metal) is used as needed depending on the project. MAPP Gas Welding: MAPP gas is gas that is stabilized and is a mix of of methylacetylene (propyne) and propadiene. This gas is trademarked by the Linde Group. With a MAPP gas kit you will usually see the standard gauges (for acetylene), and standard tips and torches. With MAPP you will get a cone (the flare) that is up to two times longer than acetylene which may make it a good choice for brazing. I have no opinion on it. Let me know your thoughts on this or any other welding procedure. Oxy Acetylene is the most common method and I have the most knowledge in it (which isn't all the immense).